It's a brisk autumnal afternoon in southwestern France, where in two hours' time the final round of the 1993 European Formula 3000 Championship will take place. In the Nogaro paddock, Gil de Ferran is staring morosely at a plate of pasta under the Paul Stewart Racing motorhome awning. "I really hate this time of year," explains the Brazilian. "It's alright for you guys who'll still be employed when the race is over. I don't like all the uncertainty, not knowing for sure whether I'll have a job next year..."
In fact, de Ferran probably has slightly less cause to fret than most, although an item in The Daily Telegraph on December 2, which reported that "the Bucks-based Brazilian is set to drive in Formula One next year, for the Footwork, Pacific and Simtek teams", appeared rather to exaggerate his prospects . . .
All the same, his first year in F3000 was suitably impressive, and if he doesn't find a place in F1 for 1994 then PSR will welcome him back with open arms. Indeed, the team has already made it quite clear that it wants to run him again, ideally alongside Kelvin Burt, who this year succeeded de Ferran as British F3 champion. But what of de Ferran's main rivals this year? What are their realistic prospects? Take championship winner Olivier Panis, for instance. It seems inconceivable that the Frenchman won't land a full-time job in F1, but will he be racing or working in the shadows as a test driver? Panis's Elf connections ought to stand him in good stead, and there remains a suitable place for him at Ligier, though there are other qualified Frenchmen who covet the same perch. If, for some reason, Panis doesn't graduate automatically, he would be the first European F3000 champion who has ever failed to do so (Christian Danner, Ivan Capelli, Stefano Modena, Roberto Moreno, Jean Alesi, Erik Comas, Christian Fittipaldi and Luca Badoer all made it, even if they sometimes had to make do with crumbs of the Coloni or EuroBrun kind). That would be a kick in the teeth for a formula in which 22 of the 34 men who raced in F1 this year cut their teeth (of the other 12, incidentally, nine were in F1 before F3000's inception). 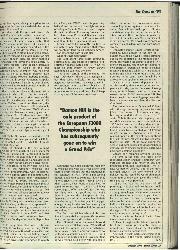 That said, the fact remains that Damon Hill is the only product of the European F3000 Championship who has subsequently gone on to win a Grand Prix. Furthermore, two of the three F1 drivers who eschewed F3000, Michael Schumacher and Mika Hakkinen, are perceived to be amongst the most glittering of the sport's young diamonds. Do such facts and figures mean a great deal? Not really. Of course the majority of F1 drivers today will have graduated via F3000. That is only logical. It's what the formula was put there for. That Hill should be the only winning graduate isn't as much of a black mark for F3000 as it might look. Far from it. It points to two things: the durability of F1's leading lights over the past decade, and a degree of conservatism on the part of F1 driver selection committees. In recent years, who has done all the winning? Williams and McLaren, predominantly, with occasional interference from Ferrari and Benetton. And who have their drivers been? Experienced hands such as Prost, Mansell, Piquet, Senna, Berger, Patrese and Boutsen, plus of course Schumacher. And note that Senna's departure to Williams means that by 1994 those drivers will all have driven for at least two of the four teams mentioned. 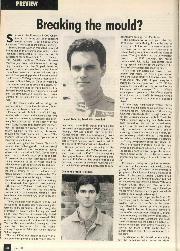 As of early December, when this was written, Pedro Lamy was the only F3000 racer whose graduation to Formula One was assured. Others, surely, will follow, though there seems little chance of a mass exodus. Of the 37 drivers who attempted to qualify for a European F3000 race this year, only half a dozen nurture even the slightest hope of being in Formula One next year, despite the fact that Grand Prix racing has seen the last of veterans Prost and Boutsen, while others such as Patrese, de Cesaris, Warwick and Alboreto face uncertain futures. Even in a world known for the frailty of its guarantees, one must assume that Panis will eventually land on his feet. Somewhere. For others, the path is less clear. The Scot spent three years getting to Formula 3000, one apiece in Formula Ford, Formula Vauxhall Lotus and F3. 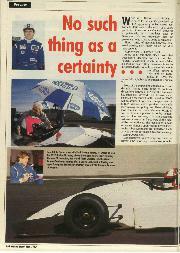 Now, he faces his third season in F3000, always assuming he can raise the ante. "That's not certain at the moment," he says. "Obviously, I'd love to be racing in F1, but that looks unlikely. I'm not being negative, Just realistic. It's easier to sell F1 to a sponsor than it is F3000, but it's still hard work because you need that much more money. Having said that, I'll still keep chasing until all the seats are taken." Coulthard has been employed regularly by Williams this year as a test driver, and there's every chance that the relationship will continue in 1994. "Even if I'm testing though, I still want to compete. I know that F1 test drivers who aren't racing, such as Allan McNish, have found it quite hard to come to terms with. 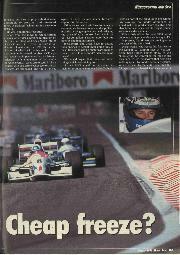 I think I still have something to offer in F3000. It's the next best thing to F1. It's good and fast, and I think I can win the championship. But there's no use asking now whether I'll definitely be doing it. Even last year, I'd only got enough money for the first few races by the start of the season. I had to find the rest as I went along." Paul Stewart, who improved beyond measure as an F3000 racer in 1993, his third season in the formula, was believed to have the necessary means and was assumed to be tacking a straight course for F1 ... until he calmly announced in late November that he was retiring with immediate effect, in order to concentrate upon developing the racing team that carries his name. Paul will eventually get to F1 in a roundabout way, for he and father Jackie intend to have their own team in place by the end of the millenium. We wish him well in his new career. It's a bold choice borne of commercial considerations and hard-nosed realism. Donington winner Olivier Beretta is rumoured to have access to the sort of F1 budget that should have F1 teams camping out on the doorstep of his Monaco apartment, but where's he going to spend it? 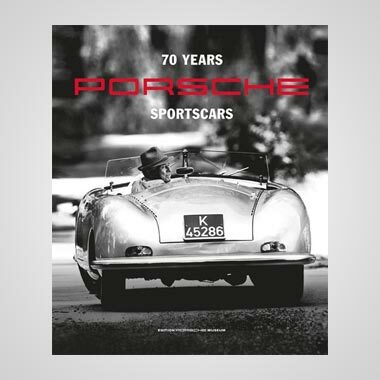 A French magazine, not known for hiding its own subjects' credentials under a bushel, recently published a full list of F1's potential runners and riders, yet Beretta's name was nowhere to be seen, even though he is known to have spoken to several teams. Olivier is in an awkward position: is it worth spending that money on an uncompetitive F1 ride, just for the sake of being there, or is it better invested in another season as an F3000 front-runner? 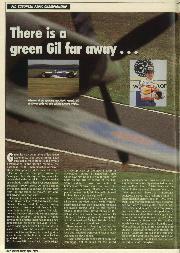 Unlike Panis, he still has something to prove at this level, certainly more so than the likes of Coulthard. 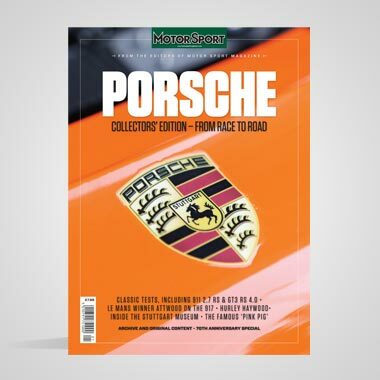 The same is true of Emmanuel Collard who, through necessity, appears to have joined the swarm of drivers currently buzzing around the dozen or so free F1 seats. This is the man who regularly outraced Panis when they were team-mates in 1992, but whose career slumped as spectacularly as the latter's blossomed when they found themselves separated for '93. Collard wasn't happy at Apomatox, and complained openly at the end of the year about the lack of unity. "It was like two separate teams," he said. "At no point during the season did both drivers and both engineers get together to discuss solutions. There was never any common direction." 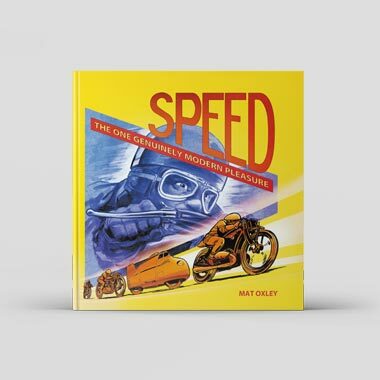 Collard only regained anything like his 1992 form in the final two races, after respected British engineer Humphrey Corbett was brought in to renew an old, and previously profitable, association. "He is," says Corbett of Collard, "one of the most talented drivers I've ever worked with. Believe me, he could be world champion within four or five years, given the breaks. He's got that much potential." 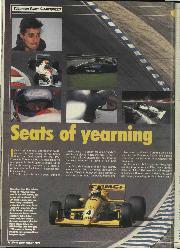 Collard has had his two years of Elf patronage in F3000, and now he must look elsewhere as the petrol giant nurtures other aspiring Frenchmen. He is one of several rivalling Panis for a place at Ligier. Should he not succeed in that particular quest, what are his alternatives? Can he raise the half a million or so pounds required to continue in F3000, or will he be forced, at the age of 22, to seek alternative employment, perhaps in touring cars? Others, such as Laurent Aiello, have already taken that option. At least, if single-seater talent is going to be frittered away prematurely, there is nowadays a chance it can be channelled towards earning a decent crust. And that in itself marks something of an improvement in the young racing driver's lot . . .